The war has finally come to Terra in Praetorian of Dorn by John French. Pitting two of my favorite legions, the Alpha Legion and the Imperial Fists, against each other in a shadowy war of subterfuge and misdirection, this novel was something I was definitely looking forward to reading. Did it live up to my expectations or fall foul of Alpharius' ploys? I have always been a huge fan of the Imperial Fists and Rogal Dorn, their Primarch. Everything about them appealed to me, and let's be honest, their color scheme is just plain awesome. Back in the day if you walked up to the table with a fully painted Imperial Fists army it was extremely impressive. It's a little easier to achieve now with the new paints, but still looks amazing. When I saw that there was a Heresy novel pitting these stalwarts of the Imperium against the equally awesome Alpha Legion within the Sol System itself I could barely contain my excitement to read it. Legion, by Dan Abnett, is one of my favorite Heresy novels and pretty much any novel that has contained the Alpha Legion in it has been very good. Plus, this was a completely unexplored event. Never before had I read, or heard any mention of the Alpha Legion reaching Terra before Horus. The story opens up just as the Alpha Legion's plans begin to unfold. All across Terra, and the rest of the Sol System, the sleeper agents of Alpharius start kicking into gear. This included digging up a couple of Space Marine who have been buried in the deserts of Terra for a decade or more. That's from before the Heresy even started. I really loved this detail since it just shows how paranoid the Legion is as well as how much they plan for any and all contingencies. They didn't know if they would ever have to activate these Marines, but better safe than sorry. Docking yards are sabotaged, ships are blown up, and a group of Space Marines infiltrate the Imperial Palace itself. This scene was really cool as they are there to antagonize Rogal Dorn more than anything else, and they definitely succeed, with only one of their number escaping, a head hunter named Silonius. The rest are all slaughtered by the Primarch himself. After this embaressment, Dorn appoints the master of his Huscarls, Archamus, to hunt down the remaining Alpha Legion agents, and keep it quiet. Archamus recruits the help of a Sergeant, Kestros, and a mysterious representative of a Luna cult, Andromeda. Together, this group begins to follow the bread crumbs and discover just how far the reach of the Legion extends. Silonius, meanwhile, meets up with the Marines unburied from the deserts, and joins them in their mission. His memory is hidden from even him, and it's only slowly unlocked as he is given certain keywords along the mission. You start to realize that he may not be all he seems and his own mission isn't nessecarily aligned with the rest of the Alpha Legion agents. I really enjoyed reading the scenes with this group. All of the Space Marines managed to be unique enough that they all felt like real people, which is impressive for a legion that is known for being all the same. I particularly liked the mortal agents that tagged along with them like Myzmadra and Incarnus, a psyker with an attitude problem. The best part about all of their scenes is trying to figure out who's betraying who, what's really spontaneous and what's been pre-planned, and what's really going on with everything. As these agents spin their webs, a larger, more traditional assault fleet nears the edges of the Sol system, which is under the protection of Sigismund; so we get to see a bit of the Templar too. It's hard to talk about the plot of this book without taking away a lot of the fun of reading it. There are so many mysteries and revelations, that to delve too deep into it would spoil everything. I will say that I enjoyed that they explored areas of the Sol System that we haven't seen before, such as several other planets, and the seedier sides of the Emperor's own backyard. All of the characters were fantastic, with Archamus being a true standout on the Imperial side of things. We get to see a bit more of his backstory in a few flashbacks, and his plot has a nice little twist at the end that really ties in well to a moment from his past. Andromeda is a ton of fun too. She's a teenage girl, but not really. She's the result of the gene-cults of Luna and is kind of an avatar of them. It's hard to explain, but will make sense once you read it. Due to this, she's irreverent, like a teen is, even to the Space Marines, but at the same time very powerful and purposeful and a vital piece to their plan. There are a bunch of awesome actions scenes scattered throughout. Some are large, blockbuster style scenes when the Imperial Fists assault whole compounds, while others are smaller, ambush style set ups; but both have equally brutal, and fast paced action. The plot continually moved forward, even when it went backwards in the flashbacks. There was never a moment where I got bored of the story and I always wanted to keep reading to find out what was going to happen. John French did a fantastic job of making the Alpha Legion feel like a true threat while sticking to their secretive nature. You never knew what was true and what wasn't as the viewpoint switched from character to character. All of their plots felt believable, and most importantly, earned. It really felt like years of planning was finally paying off as the Legion launched their penultimate ploy (or who knows with the Alpha Legion, this could have all been a distraction). The finale to this is amazing, and is everything you could have hoped for. I don't think it's too much of a spoiler, due to the cover of the book, to say we get to see Alpharius and Rogal Dorn square off. Primarch fights are always a joy to read, and this one is particularly brutal. There are a couple of huge twists at the end that could have dire consequences on future events, which is only fitting for an Alpha Legion book. 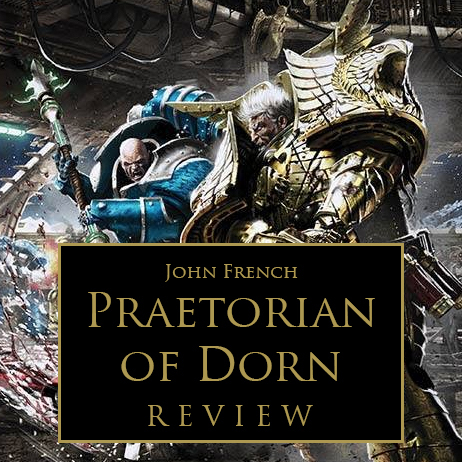 Praetorian of Dorn had everything I had hoped for from this book and more. I dare say, John French's portrayal of the Alpha Legion rivals even that of Dan Abnett from Legion. John is the Omega to Dan's Alpha. I hope that one of these two get to carry the Alpha Legion story forward in the closing books of the Heresy. He handled the Imperial Fists expertly as well, and his characters embodied all of the stubbornness and humorless nature we have come to expect from Dorn's sons. This novel is a huge milestone in the Heresy and has events that carry tremendous weight going forward, so there is absolutely no way you should skip this book. I would definitely recommend everyone read this. The only novel I think is required reading before this is Legion, though it doesn't hurt to have read as much as you can of the rest of the series. This really has the feel of being close to the end, so it's nice if you know the full weight behind the series before diving into it. It will definitely improve your appreciation for the events that unfold, but having said that, not reading everything else first doesn't detract from how great this story is either. This also happened to be one of my favorite covers from the Heresy series. It's just so intense and awesome. If you haven't read this yet, you're missing out.